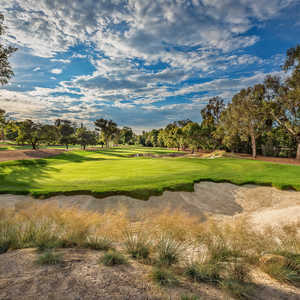 THOUSAND OAKS, Calif. -- Forget the fact that the Los Robles Greens Golf Course is just less than 6,300 yards long. It's plenty of test, and it's pretty scenic to boot. You won't forget the picturesque finishing hole at the municipal Los Robles Greens. Nestled in the foothills of the Conejo Valley, Los Robles Greens Golf Course is less than 40 miles from L.A. but feels much further thanks to the beautiful mountain surroundings. It sits at 900 feet above sea level and tumbles across a variety of elevation changes. Located just a few miles from the famed Sherwood Country Club, which used to host the Chevron Challenge, this municipal golf course is one of the most popular in the area. The course works its way around magnificent oak trees (it seems like there are more than a thousand of them), eucalyptus trees and streams. And it has quick, excellent greens. Perhaps even more impressive, however, is the service. The facility exudes a family atmosphere, from the help in the shop to the starter. It's about accepting golfers on any level, as long as they are there to enjoy themselves. 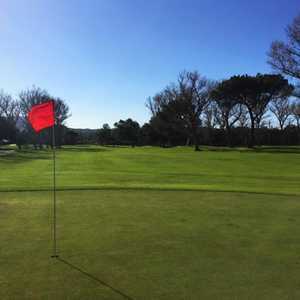 Many golfers, in fact, have reported they will drive 90 minutes or more to play Los Robles Greens for these two reasons, plus one other -- the reasonable green fees, which are substantially less than many daily fees in the Los Angeles area. 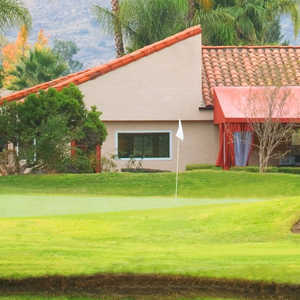 The course is situated in the mountain-lined Conejo Valley. Just 39 miles from Los Angeles, the redesigned 6,274-yard, par-70 golf course is just 12 miles inland and 900 feet above sea level. Originally designed by Bob E. Baldock, the course opened in 1964 but has undergone a redesign since. Now there are four sets of tees, which attract all levels of players. One of the first things you will notice about Los Robles Greens are the par 5s. Since it's a par 70, there are only two of them and you get a good opportunity right off the bat if you hit your drive straight and long on the opening hole, a 467-yard par 5. The second one is a different story. At 612 yards, it's all you can handle on this dogleg right. There's nothing tricky about it, though. Two solid shots should leave a short iron into the green for another scoring opportunity. The No. 1 handicap hole is the 448-yard seventh. The tee shot plays over water, but unless you top it, it shouldn't come into play. Still, most players are left with a lengthy approach. The odd thing about Los Robles Greens is the disparity between the two nines in terms of yardage. The front nine will lull into thinking the course is very short, but once you get to the back nine, it makes up for its earlier lack of yardage in a big way. The back nine is a par 36 (the front a par 34) that plays almost 3,500 yards and is quite a test. It's like you get a warm-up nine, though the front, despite the lack of yardage, is no cakewalk either. If you like good municipal golf, this is your place. There's nothing pretentious about Los Robles Greens; everything is genuine. This is also a great place to go if you're a single, because chances are you'll get paired up with golfers who love the game as much as you do. You won't be overwhelmed by the holes, but you won't be disappointed either. Some of the holes, like the par-4 finishing hole that features a beautiful water feature, are pleasant surprises. The course also has adequate practice facilities and a pretty tasty bar and grill, perfect for hanging out and regaling the day's round over a cold one. In short, Los Robles Greens makes you feel welcome, and the golf is pretty decent, too.